Ms Tenzin Dhardon Sharling is one of the few younger-generation Tibetan women who has achieved so much in a short time. After earning two Masters of Arts degrees from India and the UK, she served in the Tibetan Women’s Association and International Tibet Network, and was elected to the 15th and the 16th Tibetan Parliament-in-Exile. In June this year, she was proposed as minister by Sikyong Lobsang Sangay. The Parliament approved the proposal, but later on found that she did not quite meet the age requirement in the Tibetan Charter of 35 years. Sangay had to dismiss her from his cabinet for the same reason. As soon as she turned 35 on 23 September, Sangay proposed her to the Parliament for the Information minister post on 24 September, but she was voted out. After this, Sangay appointed Dhardon to the post of Information Secretary. Dhardon la, congratulations on your appointment as Information Secretary of the Central Tibetan Administration. Could you say a few words about the appointment? I got a phone call from Kashag on the 26th of September, asking me if I would like to serve DIIR. I have been mentally prepared to do that for the last couple of months, and I immediately said yes. It suits my interests, and it’s giving me a platform to hone my skills that I have developed in the past years, through my experience in universities and in the work space. On the 30th of September I was given a letter saying that I am being appointed to post of Secretary of DIIR, and that the procedure had been completed. This has a precedent, people have been appointed before as consultant and given a certain position. But I do know that at a later point this position as consultant will be regularised as a part of the special appointees that Kashag is allowed to make — up to 18 staff for a five-year tenure. My first concern was, does this follow legal procedure, because I’ve had a brush with the law and I’ve dealt with the consequences. I do see that the Kashag has taken prudent steps to ensure that this was very much in sync with CTA procedure and the rules. And that encouraged me to accept the offer. My appointment date was from October 4. So I ended up working here. champion a unity of purpose, and I look forward to a successful tenure under Sikyong’s leadership. Can you tell us about the fallout from the first proposal — what actually happened, and why did Sikyong have to withdraw you from the post later on? Two days before the nomination on June 1, I got a phone call from Sikyong saying that he would like me to work for the Cabinet. We didn’t know which position, which portfolio yet. So I immediately said yes, it comes as a huge honour definitely. They went ahead with the nomination, and it got approved. Then there was discussion on social media platforms which attracted a lot of attention — that I would be the youngest ever. That stirred some debate as to how old I was, and there was debate over whether I met the age requirement. I was confident that I am 35, because of when I was born. But honestly speaking, even to this day, having completed 34 and entered 35, that didn’t really strike me, honestly. So when I realised that, immediately Sikyong and I had a discussion and we said, this is breaching the rule of law. Let’s withdraw the nomination, and wait until I am actually 35. That was a mutual decision, and respects the Charter. What happened later, it’s clearly in everybody’s mind that my nomination would come again. A lot of times when people know who the nominee is, there’s a tendency to charge that plan. It’s not unique to Tibetan society or politics, but in a lot of areas it does happen. The members of the Parliament are my close and respected colleagues. I think they all had to make a certain decision — they were all performing their duty as elected representatives, under an entirely twisted scenario, unlike the June nomination. Even if I was a member of Parliament, I can’t say what I would have done in the same situation. I would be reacting to circumstances, to certain pressures. So I do respect the 27 members of Parliament who voted me down. Because it was by their reasoning, the logical arguments, they had to vote me down, in their role as parliamentarians. So I have no grudges against anyone. If someone has to be responsible, that has to be me. I am the one who overlooked the age requirement. That’s the consequences, and I think this comes as a major lesson for all of us. The Charter is above any individual. Unintentionally or intentionally, if the consequences are such that it points towards a disregard of the Charter, any individual will have to face the consequences. So I stand as a testament. So I have a sense of pride, I respected their decision, I don’t doubt their intentions. I would like to believe that whatever they did was to uphold the significance of the Charter. So then the logical conclusion was that I would be out of the scene. But opportunity came knocking again, and I ended up as Secretary of this department. And information is my forte, my educational qualifications, experience in journalism, as media coordinator. So I do hold this position with a sense of confidence, I don’t feel like I am a novice at this. The last four months made me a better and wiser person. I faced a storm, and as we say, the waves never stop coming, and you need to learn to surf, and I think I’ve done that. So I think this will set a good example to the Tibetan community. I hope to encourage the younger Tibetans, the youth and women, to always just go ahead no matter what. It’s your call, it’s in your control how you want the story to end. When everything turns back against you, if you are really committed to something, it will come. When one door closes, the other door really does open. I really hope that this will encourage people. If someone accuses you as someone who tramples on morality and ethics, because they feel you disregarded the Charter … and because of that, in the second proposal, you lost — how would you answer such an accusation? A dramatic turn of events took place, it definitely was not in my control. And the public should step in, in a democracy. There were a lot of positive comments coming my way, and also there are a lot of people with a critical frame of mind. But it shows the public involvement in a case such as this — 10 years ago, the public didn’t care what was happening, they did not get involved. If people want to accuse me of intentionally trampling on the Charter, my conscience is clear, I know what really happened. If I had intentionally done that, I’m the type of person who would admit it and apologise. But I stand by what I said on June 3rd. It was sheer oversight, a major oversight, it shocked me also. But I think when you become a public figure, there are certain tags that come along with it, and one is public criticism. And I think true leadership is being able to rise above all this. This will keep coming. The next four or five years, this will be part and parcel of my life. People will not always say good things about me. I think for me to be able to take this in my stride, and learn from the kinds of criticism that is coming my way — that’s something that I will be doing. After you were proposed by Sikyong Sangay the first time in June to be a minister, you were approved by the Parliament. With what kind of imagination did you step in — what were the first things you thought you would change? And now you have the opportunity to do that again, now you are holding the second-highest post in the department. What are the things that you want to change? I’ve been a vigilant observer of DIIR since 2004, when I first was working as an intern with VOT. I would come and interview the senior staff of DIIR. It interested me what DIIR was doing. I had a liking for the work that they do. I think that this is the single most important department that speaks of the political struggle of Tibet. One of the former secretaries, Kalon Tenpa la has been a father figure to me. He also served as the DIIR kalon, he’s one of my role models in life. So people I look up to had been at the helm of affairs in this department. When I was initially asked to handle this portfolio, my first reaction was to feel completely overwhelmed. And then later, you have to sit in a practical frame of mind, and get to work. All I really cared about is that this department is the political spokesperson for the Tibetan struggle, for His Holiness, for CTA, for people inside Tibet. One thing that China is really annoyed about, with His Holiness and us, is the internationalisation of the Tibetan issue. That is the pressure point for China, and they don’t like it. That’s why they are having to make adjustments and accommodations. So this department works in terms of maintaining the Tibet Support groups, in terms of amplifying the Tibetan voice in the global arena. So I was thinking more about the larger picture. We need to sustain this movement. The Tibet story needs to go out to the world at the time that the Middle East story is taking centre stage, and Tibet remains the most under-reported story for years and years now. The sacrifices that people make in Tibet is only a one-day news story, and it doesn’t go beyond that. How do you translate that into action? And secondly, how to we bring China to the negotiation table? How do you make a level playing field for both the key actors: The Tibetan government-in-exile and the Chinese government? My key priority, is having a good communication strategy, how you win supporters, and how you make people who are hesitant about touching the Tibetan issue to hold it up with a badge of honour. And secondly, dialogue, we really need dialogue, but we shouldn’t sound very desperate. The ball is in China’s court, but I think there are a lot of weapons in our hands that China doesn’t have. The fact that we have been historically independent. That we have His Holiness as the key champion for our cause. That we have held the mantle of truth for the last 70 plus years. So to be able to re-strategise the whole resolution of the Tibetan issue. And what do we mean by that, we all have different connotations, how do we come to an understanding. So to put in a vision to that, and bring every actor to that, governments, world leaders, to that understanding. That definitely was in my mind, that is the broader picture. But more specifically, this department, the communications departments like Tibet.net, Tibet Online TV, have made a lot of progress in the last 5, 6, 7 years. They live in the information technology era, and they’re living up to it. We live in an age where there’s so much happening in the clouds, not on the ground. So how do you harness the potential that technology provides you? China is spending billions, but I think that as long as we have a good message, a good channel, a good audience, I think we can far supersede the propaganda war that China is waging against us. So strengthening the technology capacity of this department is definitely on my mind. Now that I am a secretary, I cannot undermine the importance of this position. It’s not just a title, there’s a responsibility that comes along with it. So the vision I had for this office, I’ve been thinking very hard day and night, and networking with people, writing to people, having my own set of advisors. So all the things I’ve been thinking of, I really hope to put it into action, and realise it for the next four years. The kind of vision and the strategic plan that I had for the kalon position remains the same as Secretary. What matters about all this is the work, the results, the output. Thank you, congratulations again, and wish you a very successful tenure as Secretary of DIIR. There are 29 comments so far. 2021 is going to be interesting. .. Penpa Tsering vs Gyari Dolma vs Dhardon Sharling. Competition will be tough as each Cholka will lobby for their own candidate. Though I wish Penpa Tsering wins this time as Gyari Dolma can be home Kalon and Dhardon Sharling can be DIIR Kalon. But 2026 is for D S — first female Sikyong. Her appointment absolves her of the criticism coming from a few cynics putting forth their arguments on flimsy premises and posturing that she lied and trampled on the law. While I recognize this as a gaffe on her part. This announcement will silence the critics and boost the morale of the majority of Tibetans and well wishers who can now rejoice with the feeling they haven’t yet ‘lost a great leader.’ Also Tibetans are closer to getting the first female Sikyong. I don’t believe this, what Dhardon is saying that it’s her oversight about her age. I think that everybody knows their age, and nobody will say he/she is 35 when they are 34. I think she was using this as an excuse. It’s good that the Parliament rejected her from appointing a kalon. If it’s oversight, we don’t need someone as DIIR kalon as oversight leading that department will cause tremendous problems for Tibet and Tibetans. Even before becoming a kalon, probably she has been dreaming to be a Sikyong. So ambitious, but too big for her. I think that LS, he’s so desperate for a woman kalon Now let’s she who he gets, and when he gets one. I am reading this interview only now after a non-Tibetan friend of mine told me about this ‘phenomenal’ piece that shows Tibetan youth in a good global light. Well, I don’t think this interview is worth the hype, but what is certain is that Ms Sharling is one such individual who can put individual interests behind and preserve the dignity of the Tibetan Parliament as a former Parliamentarian herself. If it was me, I would want to expose the politics in the Parliament that led to her eviction. Rather she chose to take the blame. This is leadership and may be a Tibetan leadership style. Bypassing of the experienced CTA staff by honorable Sikyong and accepting the big post of Secretary through telephonic conversation by Dhardon Sharling is an immoral and big mistake from both ends. She may have big will to serve in CTA but should start from ground level. Experiences must be counted in such a post. May be there is big reason as her name coming in Sikyong’s dream team. This is journalism. This is how Tibet Sun over shines Phayul.com. Good job, Tibet Sun. Keep up the good job and keep doing what you are doing. This kind of journalism is what we really need. I deeply feel that it’s not at all necessary to hold a government office for any other official or semi-official platforms for one to serve the nation — it’s not that without which doors are closed. Having to hold a designated post is not a mandatory condition to render service to the nation. There are, in fact, many figures who serve handsomely to the nation without clinging to any official office and post. Jamyang Norbu, Lukar, Samten Karmey, Tashi Tsering, and the list goes on endless… who serve in their individual capacity as a Tibetan – in fact better than those office-bearers and post-occupiers. If Sharling is truly an honest civil servant, and recent events were mere inadvertent and accidental, its high time for her to prove same to people to reinstall the trust she has lost by working devoid of any official post. Immediately jumping on DIIR Secretary post despite recent events and subsequent disapproval by parliament speaks something fishy, casting much basis of suspicious. Why have to hold an official post is a question..? Why that of DIIR in particular is a bigger question..?? CTA nowadays is lost in counting 24 Mil from USA and instating Dhardon Sharling no matter what may come, rest other matters (TCV minor child were put up in juvenile home/jail for 45 days and now on bail) are not subject matter of CTA for them. Who will care for them (Tibetans in need) if CTA will not look after its own people? China or Pakistan???? If CTA now under particular head can not look after the welfare of its own Tibetan people in need than we better change the name CTA itself into some private office of certain politician who comes and goes with time. We heard kashag and security head offices in Dharamshala are doing nothing towards the matter than just diverted the subject matter to their sub-ordinate or regional TSO Dehradun. What if that child is a child of Mr Lobsang Sangay or child of any higher official of CTA, situation or scene will altogether be different for him then. WAKE UP! we really need to help this child who really seem promising in his studies and without any parental support and with his class 12 board exam approaching in the month of March, we really need to do something before its too late or he is being deported elsewhere, which will be a big shock and subject of shame for all of us. do something before its too late! Gain from her business? A friend I know in Massachusetts tells me she is giving up on her PhD scholarship of $50,000 per year from University of Massachusetts (USA) to work for CTA for just $2,000 per year. Name one Tibetan who can do that. Name one Tibetan? Dhardon la is not alone. Harvard scholar Dr Lobsang Sangay la is first to do so. She is just following in his footsteps. So I don’t think we should give her undue credit. What would she say to her U-Tsang supporters? Of course, everyone in the field of politics are opportunists, where nobody cares for the general populace except to make them a ladder to reach ahead. I was anxiously waiting for what if all the attempts of Mr Lobsang Sangay to install her from Cabinet portfolios not once but failed twice, and than this final call of secretary scene happened under his discretionary power; what if he still fails in appointing her? That would have been more interesting. I am sure Mr Lobsang Sangay, being a law graduate himself from India, knows very well about consequences of criminal breach of trust and violation of oath under Indian penal code if brought into light. Like everyone I was wondering why Mr Sangay was so desperate to install her into any of the positions, not once but thrice he tried, why??? Normally Mr Lobsang Wangyal was forefront in asking specific questions in interviews, but this time he seem to have succumbed for with his own beleive and ardent bahkts of Mr Sangay. Anyways, congratulations for acquiring Indian citizenship Mr Lobsang Wangyal Chaudhary. ‘Criminal breach of trust’??? Bro you need to study law. 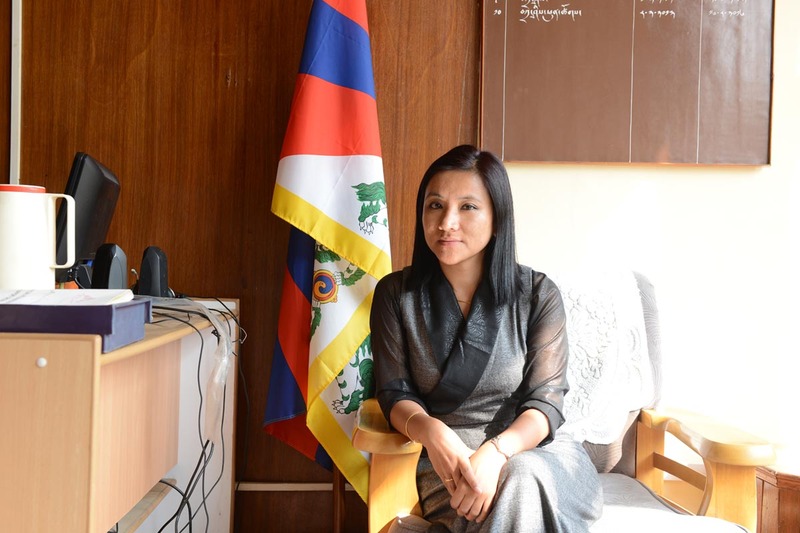 Lobsang Sangay is keen on reinstating Dhardon la because he stands privy to how she was being made a victim of petty politics in the Parliament. So her appointment is a slap in the face of the trivial-minded politicians who made her a scapegoat to achieve their vested interests. You normally are very critical of Dr Sangay. but his grave act in handling this case she more importantly in standing his ground deserves some praise. The day is not far when Dr Sangay will pass his ‘Sikyong’ mantle to the very promising activist-turned-politician-turned-academician-turned-bureaucrat. This will be breaking the steel ceiling. Ache Din Ana Wale Hain. Aache din toh patta naahein par acche raat zarror aaane wala hain, in fact must have already arrived. Not me but you need to study law and see to yourself what is there in Indian laws and speak accordance with it. Though have nothing against anyone, but level of politics and using laws of both internal and national law were exile government being established in their own favour, believing nobody will know or care is not fare. I also appreciate the level of work Ms Sharling has done for herself for her own future, but purposely hiding her identity in terms of her age with an mandate aimbition is not done. Likewise I dnt think she is 35 but in her 39 or 40’s if things and data are taken into consideration in our own ways. I believe its another case of tempering with once own age in terms of getting political or official milage. We all will only know what is the actual or real date of birth of Ms. Sharling only when she dies and astrologies conducted as per her Tibetan age. Picture abhi baki hain mere dost! Really impressed by the level of intelligence and humility displayed by Dhardon Sharling. All I can say is she is the future Sikyong candidate for Tibet and from all 3 provinces. Thank you for being a role model for youth and women in world. I have never seen a more articulate leader with the depth of knowledge and understanding in a young leader. Congratulations! I am sure you will do good…..and next term….you will stand for the sikyong seat!!!!! Nice, I’m proud of you. Do well and don’t forget what you had said during the voting campaign. “I made through the storm I created” would make a better title for this interview. Reading through the interview, I am not sure if she brings any new skill set to the department that is not available in CTA given its large contingent of over 500 staffs. The goals she mentioned for DIIR are mission statement of the department that anyone appointed to this post can recite. I don’t see any concrete action plan she brings to the table in this discussion, may be she still need to do her homework. Another angle to her appointment despite her criticism of Sikyong’s previous tenure is to my mind nothing but to leave a political legacy for Sikyong himself by nominating the most voted U-Tsang Chitue. Dhadon la, if you are reading this, you also betrayed the U-Tsang people and taken for a ride. So far I haven’t heard any apology to the people who voted you and made visible in public domain. U-Tsang people who have sent you to represent them, after much controversy landed in a bureaucrat job. What an irony? I think it is still not late to offer an heartfelt apology. Don’t take people [for] granted. Finally, while the storm has desisted, I hope you will work hard and prove yourself to be worthy of the post and reclaim the trust of people. It’s amazing how an inexperienced person (only 5 years as chitue) can be appointed as a CTA department secretary, bypassing highly-experienced and senior CTA bureaucrats who served 20+ years. The secretary posts in any country including CTA are held by seasoned and experienced bureaucrats. In fact this always been a post of bureaucrats, not politicians. It upset me to see how LS moved two secretaries of DIIR to different positions to accommodate Dhardon Sharling and have her appointed. She lost the kalon seat because she misled chitue and Tibetan people in the beginning. Now after losingthe kalon appointment, she was appointed as secretary which is absurd. Please stop playing games with the Tibetan people and our constitutional charter for personal gains and favor. I’m writing this with so much pain and disappointment with how people are appointed for individual gains. The irony is she was the same person who pointed out at chitue election debate about how LS appoints his friends and cohorts without looking at qualifications. Today, she is at the receiving end of that favoritism, and it seems perfectly alright for her now. What a shame! This is hypocrisy, immoral and double standard. She upset many of her well-wishers due to her misleading everyone with her age and unethical issues involved in the last few months. BHOE GAYLO! I read only your answer up to the second question, and the last paragraph answer for the second question where you said “when everything turns against you” is not relevant to your situation as you had to be turned down due to the charter, but not all being against you, is not it? Anyways I understand you do well. All the best !! As long as monks and Rinpoches are not in the CTA, or in the Politics, we are doing fine. Not only monk n Rinpoche but sanjowa too…. The former youngest Tibetan MP turned Secretary (for Information), DIIR, CTA, provided encouraging and strong responses in an interview by Tibet Sun journalist Lobsang Wangyal in the wake of the storm. She lulled the storm in the most pacifying, accepting, and solidifying vein, remaining pretty tough but respectful of all. To me, her replies indicated her maturity and statesmanship in the politics and administration of Tibetan Central Administration (known as Government-in-Exile) despite her youthfulness and mere six years of legislative experience. Both her prior and current contributions to the Tibetan community (be it in NGO-TWA, PEN-International, ITN, et al) makes her experience more qualified than her age. DIIR seems her destination of destiny. Her communications skills surely suit her current position (of course also as Kalon). She is the control panel of DIIR even before entering into the office. It appeared she followed her dream with conviction and knack against all odds and rugs of critics. The best part is she stood her ground and accepted mistakes (I mean the oversight thing), remaining undeterred. It is the best thing to do in such circumstances. All the best Madam Secretary Sharling Tenzin Dhardon la. In my opinion, this is called a phony appointment. I believe that she doesn’t care about it. I think she loves only the post and the ename,, and Secretary Post is one of the highest posts in DIIR. I think that Sharling Dhardon never really worked under CTA’s Administration. I don’t think that a few days training on Administration, 5 years of ChiTue’s experiences and NGO’s experiences are enough to put her on the highest position in CTA. All the CTA Secretaries are having 15-20 years of Administration Experience in CTA, and more. I accept the new law where 18 staffs can be directly recruited by SiKyong. But in my view this is an unacceptable decision by Sikyong to give CTA’s highest position to an inexperienced person. Missing an important question: What would you say to U-Tsang communities who voted you for Parliament member? Not just voted, you were the top one among your colleagues.